John F. Saladino was born in Kansas City, Missouri. A graduate of Notre Dame and the Yale School of Art and Architecture, he worked in Rome with architect Piero Sartogo before returning to New York to open his own design practice. Saladino Group, Inc., founded in 1972, has grown into a full service architectural and interior design organization with a staff of 30. Current projects range from apartment renovations to corporate headquarters. Mr. Saladino's present architectural commissions are a 24,000 square foot residence on the West Coast, an 8,000 square foot apartment on 5th Avenue, and a Tuscan style farmhouse in Montecito, California. His work is published regularly in books and design magazines in the United States, England, France, Germany, Italy and Japan. In 1986, Mr. Saladino started his own furniture company with no less than sixty new designs. These designs continue his philosophy of mixing "old with new" and demonstrate his full maturity as an artist and a master of scale. The historical references in his oeuvre are always implicit; from the Villa of Mysteries in Pompeii through Palladio and William Kent, there is a genuine love of history that permeates all of Mr. Saladino's designs. The humanism from his long tradition endorses the human scale and comfort. The furniture, all of which is based on simple geometric forms, is intended to appeal to both the traditionalist and the modernist. Mr. Saladino, who is frequently referred to as the "designer's designer," has won numerous Interior Design and Furniture awards and has served as a board member for a number of organizations, including Formica, Parsons School of Design, Steuben Glass, Save Venice, and the Sir John Soane Museum Foundation. Saladino biography partially courtesy "Interior Design Hall of Fame," into which Mr. Saladino was inducted in 1985.
of the "Facade Collection by John Saladino," 1984. 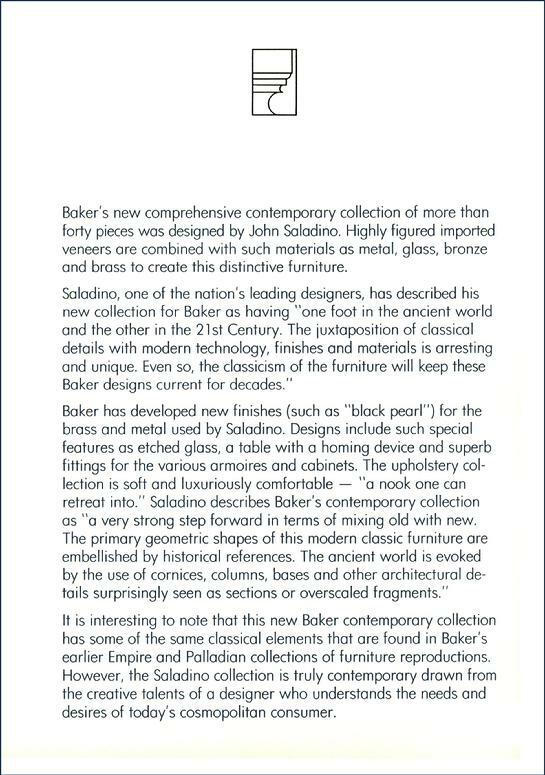 Saladino's "Facade Collection" was introduced by Baker at the fall 1984 High Point, NC furniture show. The collection began shipping to Baker showrooms and retailers in the spring of 1985. A YEAR and a half ago, when Baker Furniture asked the interior designer John Saladino, above, to design a new furniture collection, he came up with the Facade Collection - 60 pieces that include upholstered furniture and lacquered cabinets, above, as well as metal tables, below. ''The furniture is meant to be classical and sympathetic to any given environment,'' Mr. Saladino said. So sofas are at a traditional height and credenzas, cabinets and tables sport bits of post-modernist detailing, such as half-columns and moldings. The upholstery is often pleated and a little loose, and the sherbet tones are the colors the designer has championed since 1970. An armless dining-room chair is $696, a fitted credenza is $4,472 and an end table is $1,404. Most ambitious is the Rustication Bar, above right, inspired by the Palazzo Rucellai in Florence. It is $8,235. The collection is on the seventh floor at B. Altman & Company. 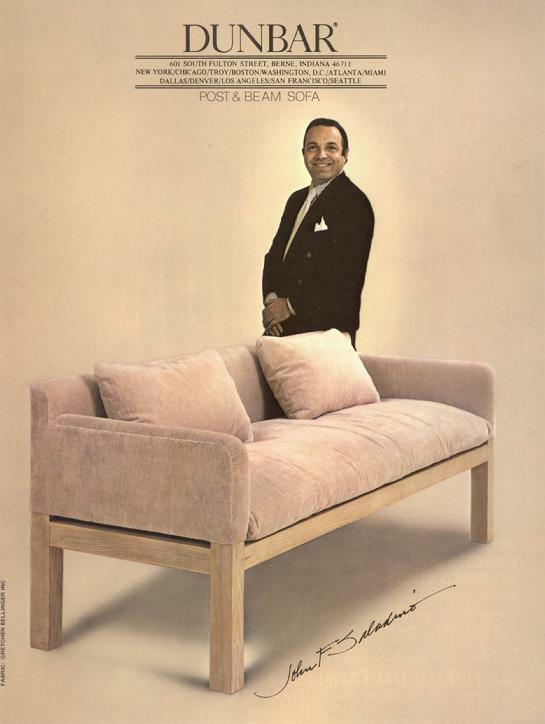 A Dunbar advertisement featuring Saladino's Post and Beam sofa in bleached ash, introduced in 1981. This sofa garnered Saladino a Daphne Award for "Best in Show." Saladino earned another Daphne award in 1985 for his Baker "Facade Collection." Beginning in 1981, the Daphne Award was presented annually by the Hardwood Institute honoring the very best in furniture design. John Mascheroni also won a Daphne in 1981 for his upholstered work with Swaim. Bill Faber won in 1985 for his Henredon work, Jay Spectre won for his Century Furniture collection in 1986. Baker Furniture was a consistent Daphne winner. In 1995 the first Pinnacle Award for furniture design excellence was made. Presented by the American Society of Furniture Designers, the Pinnacle has become the most important American award for excellence in furniture design.